This is a super fast and simple pasta dish that will taste like you worked much harder than you actually did. It’s also a great way to use up leftover vegetables as you can add whatever you have on hand over and above what I’ve listed here. No chicken in the fridge? No problem. This is also just as yummy as a vegetarian dish. The toasted almonds are my favorite part as they add great crunch and flavour. First, toast your almonds in a dry pan on medium heat- watch them carefully as once they begin to brown, they can burn very quickly. You want them a nice golden brown. In a deep pan, saute vegetable in melted butter for 4-5 minutes. Stir in the flour and curry powder and cook for 2 minutes, stirring constantly. Add tomato and simmer for 5 minutes. Add stock and sour cream and simmer until thickened. 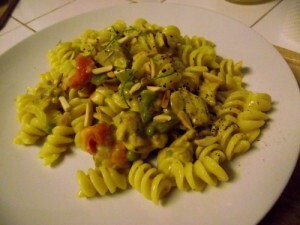 Stir in cooked chicken and pour over rigatoni or penne pasta and top with toasted almonds.